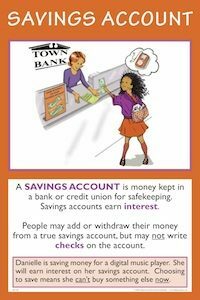 A SAVINGS ACCOUNT is money kept in a bank or credit union for safekeeping. Savings accounts usually earn interest. People may add or withdraw their money from a true savings account, but may not write checks on the account. Danielle is saving money for a digital music player. She will earn interest on her savings account. Choosing to save means she can’t buy something else now. A savings account is money kept in a bank or credit union for safekeeping. Savings accounts earn interest. Typically, people may add or withdraw their money from a true savings account at any time, but may not write checks on the accounts. In this sense, savings accounts, unlike checking accounts, are not demand deposits. Checking accounts are considered part of the M1 money supply. Because it is relatively easy to get money out of savings accounts, savings deposits are often referred to as “near money” and are considered part of the M2 definition of the money supply. A money market account (MMA) is a special type of savings account offered by banks and credit unions. These accounts are FDIC insured, but require a minimum deposit (averaging between $100 and $2,500) and have strict limits on how money may be withdrawn. Unlike regular savings accounts, MMAs have limited checking privileges, usually three checks per month. A MMA is not the same as a money market fund, which is not FDIC insured. Both, however, are very liquid (easily converted to cash) and are considered secure investments. Savings accounts are considered very safe and liquid investments, but they typically offer a lower return than other riskier investments. Banks and credit unions usually lend the monies deposited in savings accounts, charging a higher rate of interest than that paid on the savings accounts. This is one way banks try to earn profits. Poll the students to see who has a savings account. Discuss how students started their accounts and how often they add to the account. Discuss how interest rates may vary from bank to bank. Have students report back on the interest rate they earn on their accounts. Using the Internet, phone, newspaper, or other resources, have students compare savings account and/or money market account rates in your city or region. Report back on research findings. Using Bankrate.com, calculate how savings will accumulate over time. Click on Calculators at the top of the web page. Then scroll down and click on various savings calculators, such as the Savings Goal Calculator and the Lunch Savings Calculator. This clever calculator tells how much you can save by bringing your lunch instead of eating out every day. Have students calculate how much they would save in 30 years.